According to evleaks, the 4.5 inch 1080p screen sporting Ascend P2 is one of the, or rather *the* first smartphone to have a smaller display at full HD resolution. The Ascend D2, which was launched at CES 2013, has a 5 inch display at the same resolution. 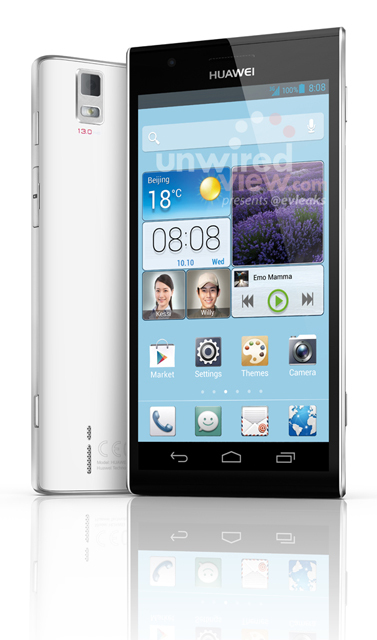 The Ascend P2 is expected to launch at the Mobile World Congress 2013 with specs matching that of the D2, including the K3V3 Quad core processor, wafer thin body, 2 GB of RAM and a 13 megapixel BSI camera. The phone also sports a generous 3000 mAH of capacity for its battery and is expected to run Android Jellybean out of the box, if it wasn’t more obvious. Evleaks speculates that the frequency of the Quad core processor on the Ascend P2 might be 1.8 GHz, which seems unnaturally high for a smartphone. The Ascend D2 was destined to be released only in China, and it seems like the Ascend P2 will be the one going global, with a slightly better screen in terms of PPI(489 vs 443). We certainly look forward to the Ascend P2 at the MWC 2013.